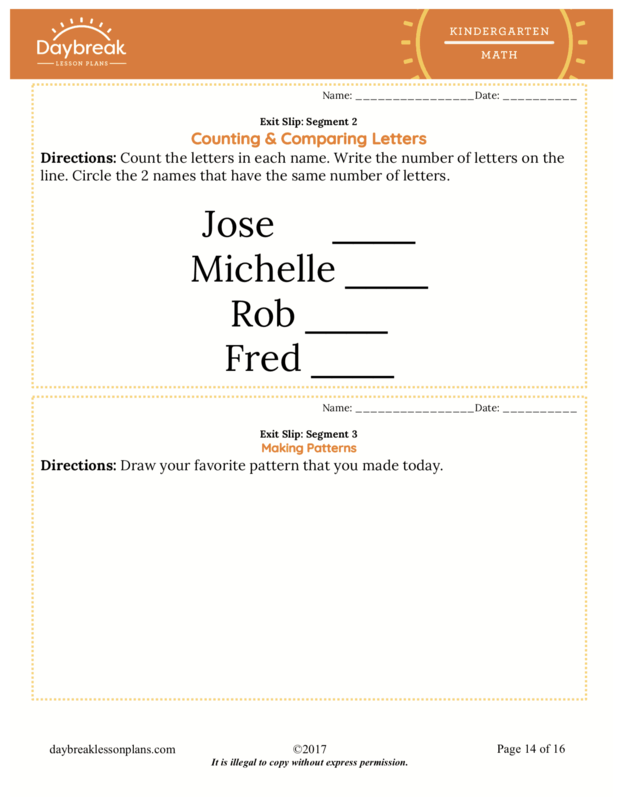 Skills: Rote Counting Numbers 1-20, 1 to 1 Correspondence Counting 1-20, Counting up to 20 Items, Count to Answer "How Many of Something?" 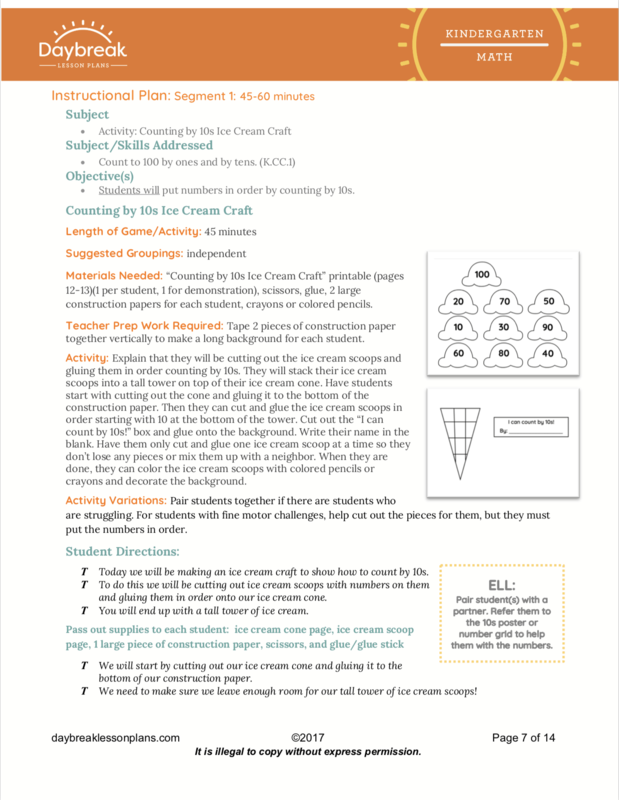 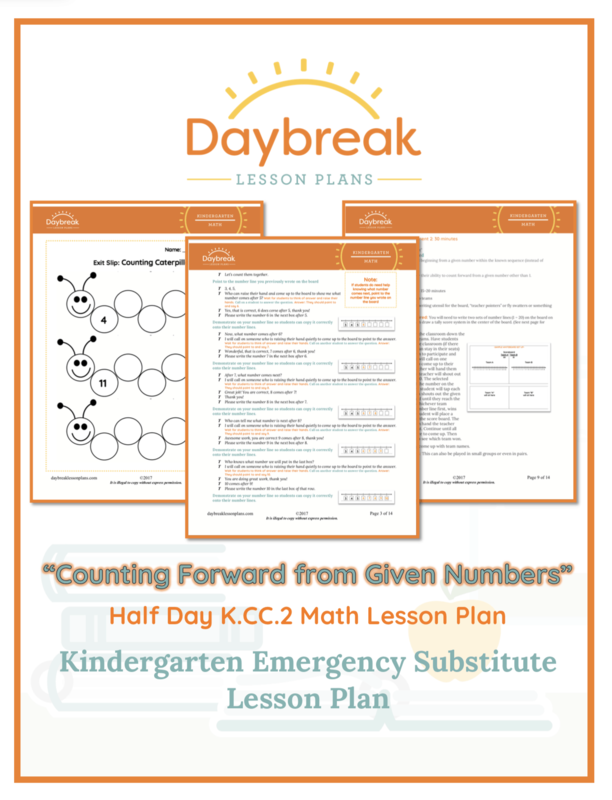 Description: This fully scripted Kindergarten half day lesson plan is broken down into 2 separate segments (30-60 minutes each). 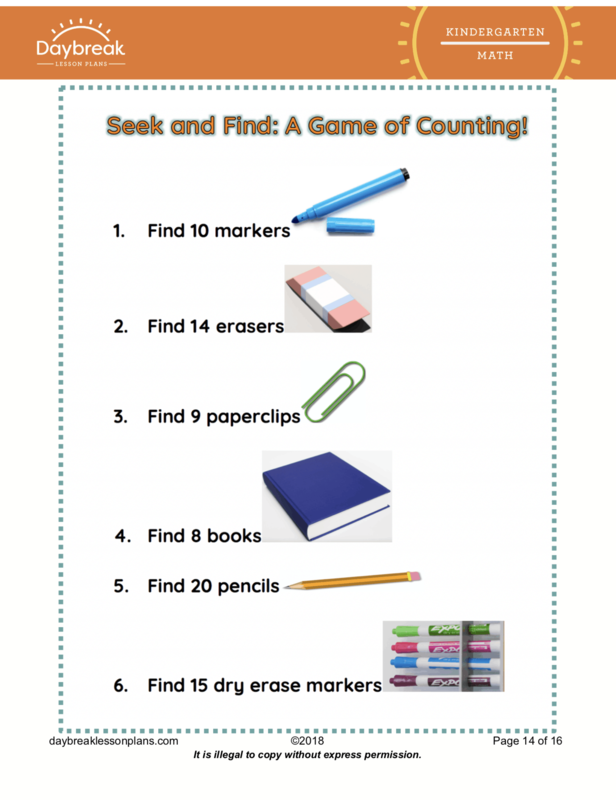 The lessons address Counting and Cardinality: Count to answer “how many?” questions about as many as 20 things arranged in a line, a rectangular array, or a circle, or as many as 10 things in a scattered configuration; given a number from 1-20, count out that many objects (K.CC.5). 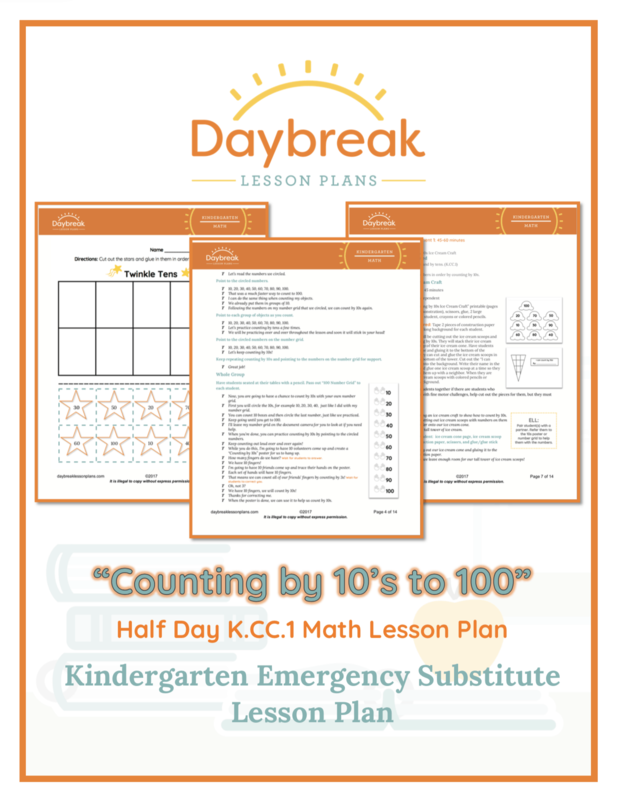 Description: This fully scripted Kindergarten half day lesson plan is broken down into 2 separate segments (30-60 minutes each). 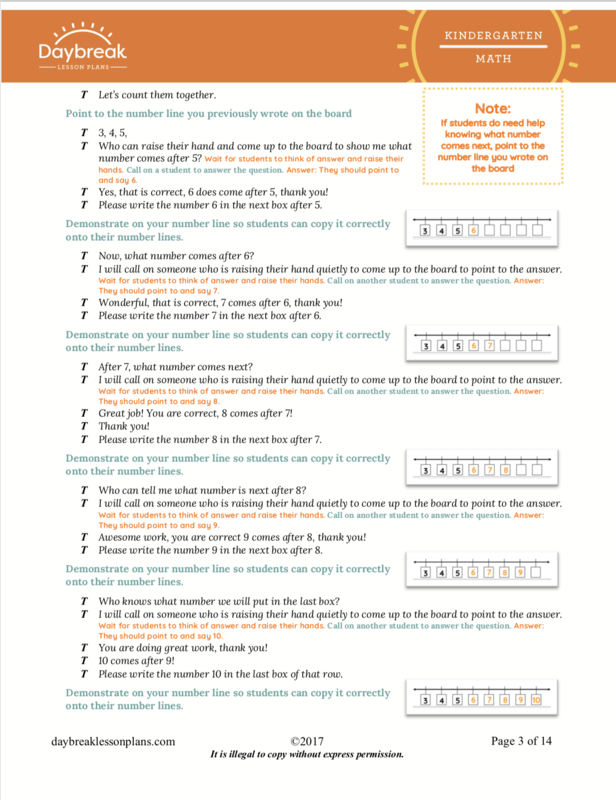 The lessons address Counting and Cardinality: Count forward beginning from a given number within the known sequence (instead of having to begin at 1) (K.CC.2). 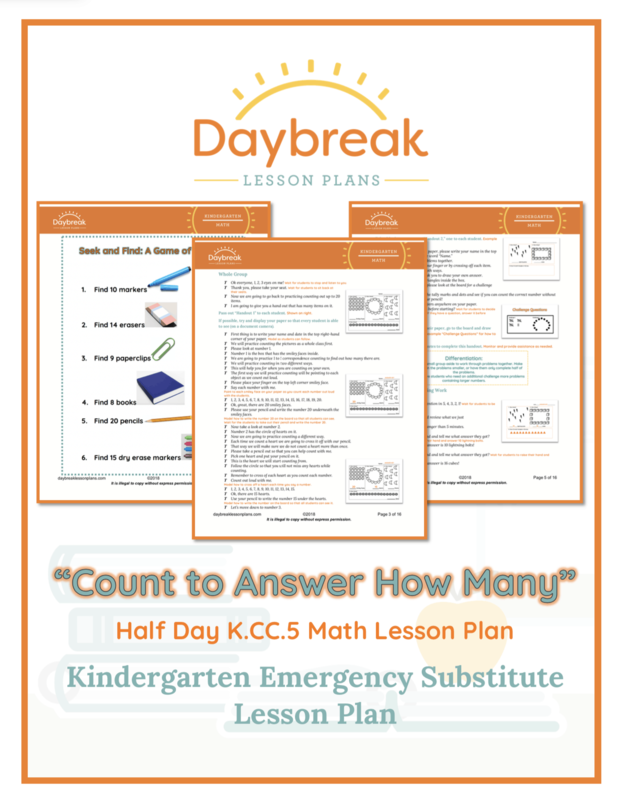 Description: This fully scripted Kindergarten half day lesson plan is broken down into 2 separate segments (45-60 minutes each). 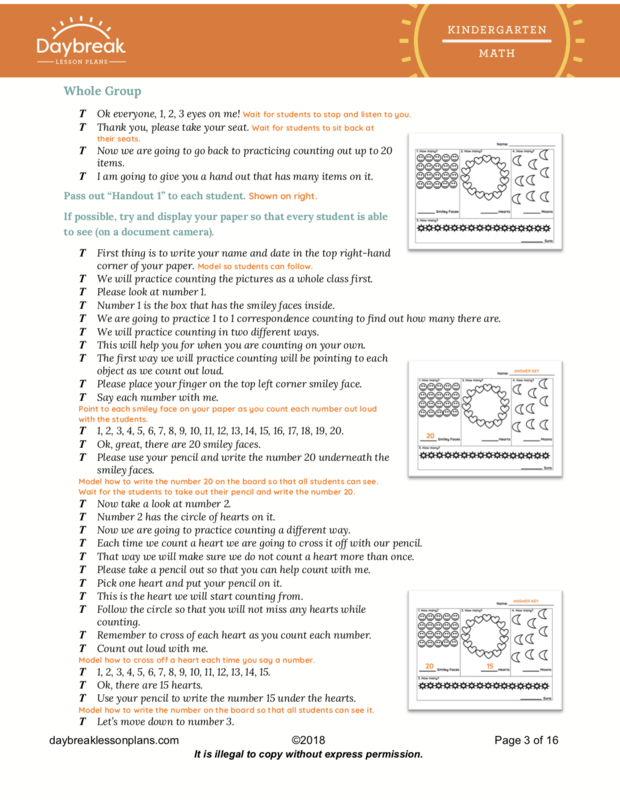 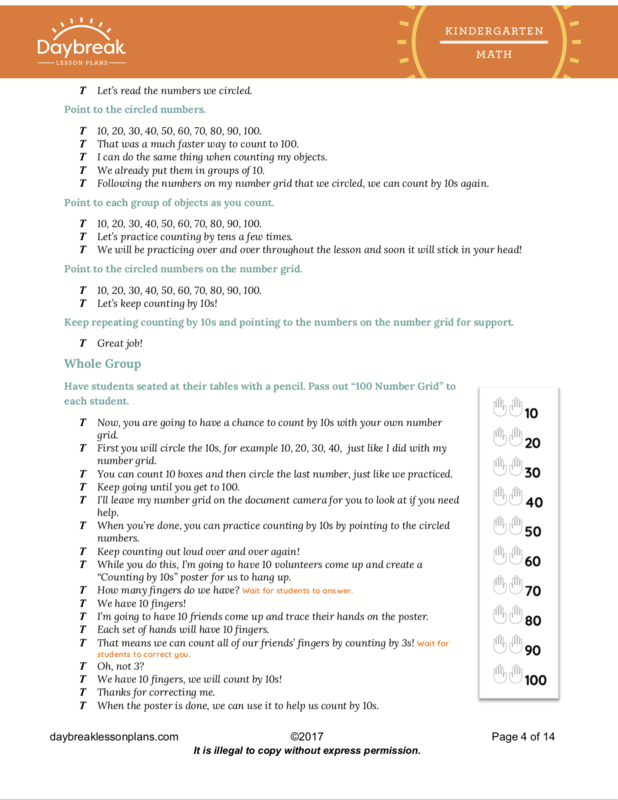 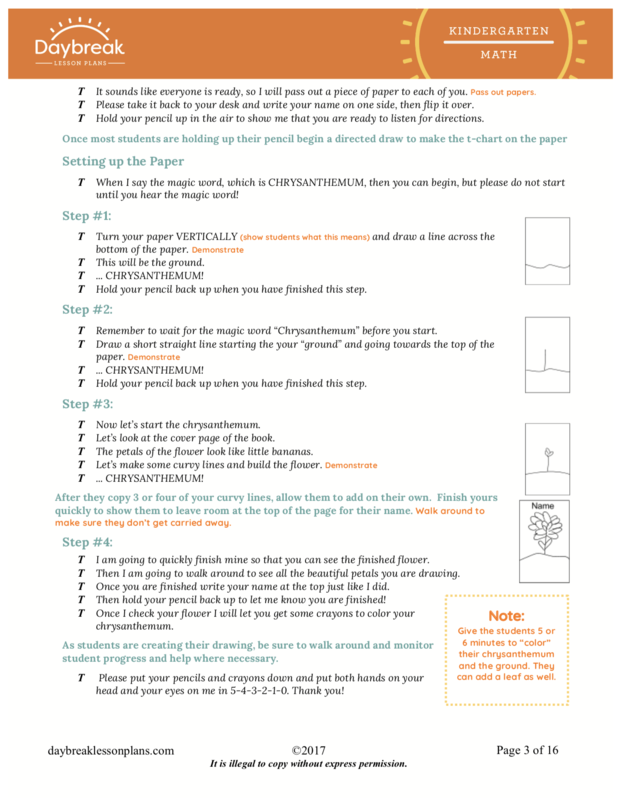 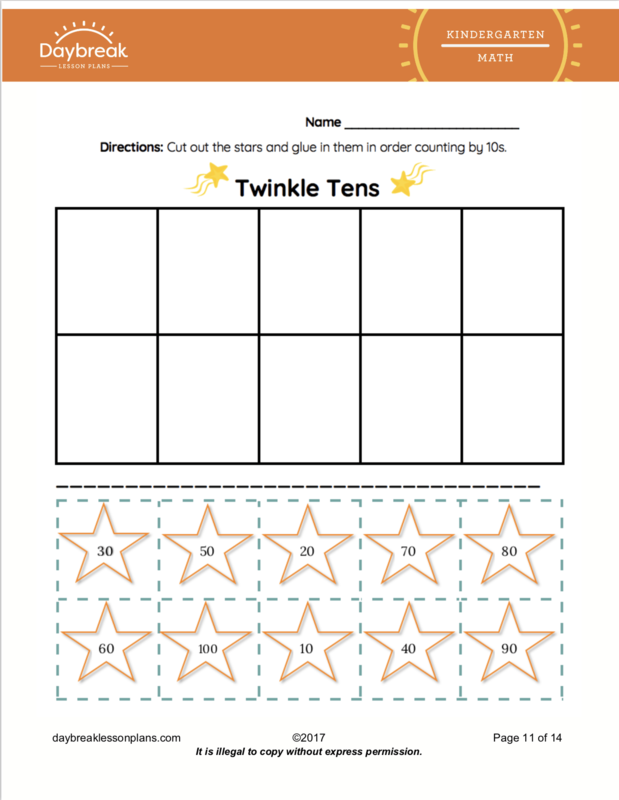 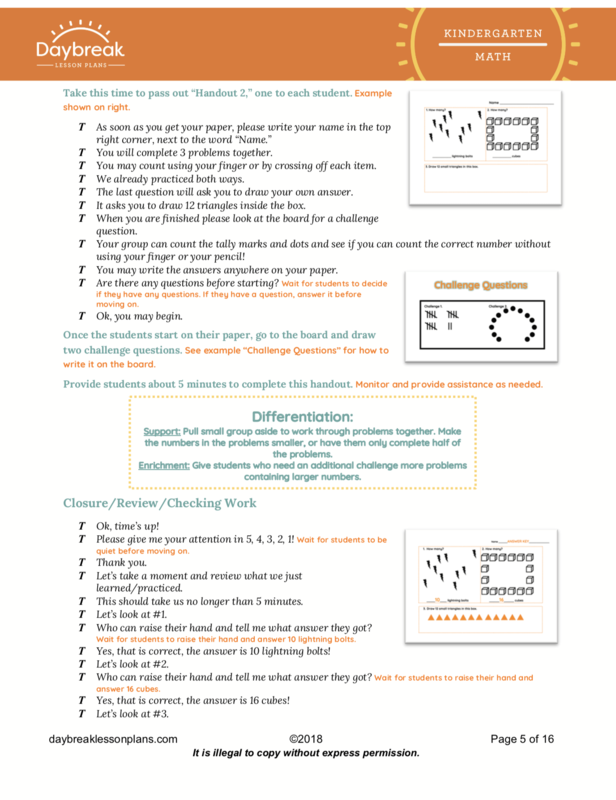 The lessons address Counting and Cardinality: Count to 100 by ones and by tens (K.CC.1). 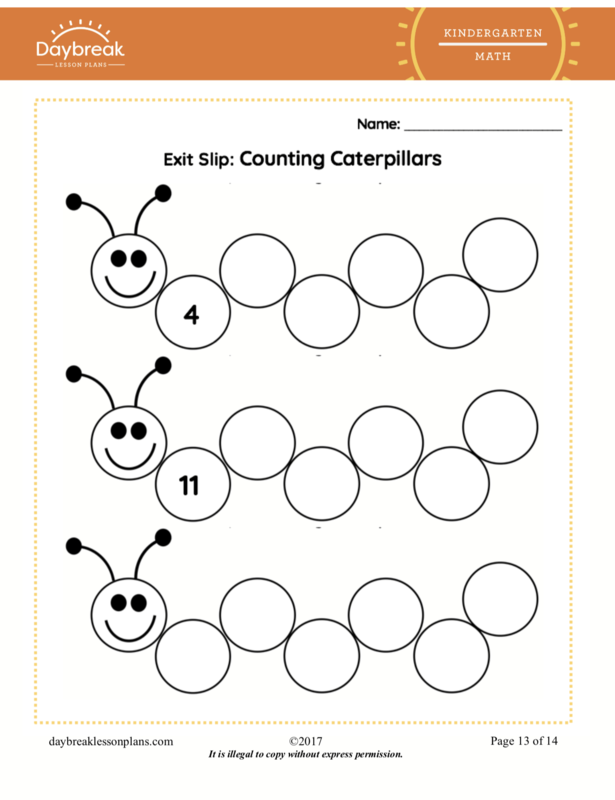 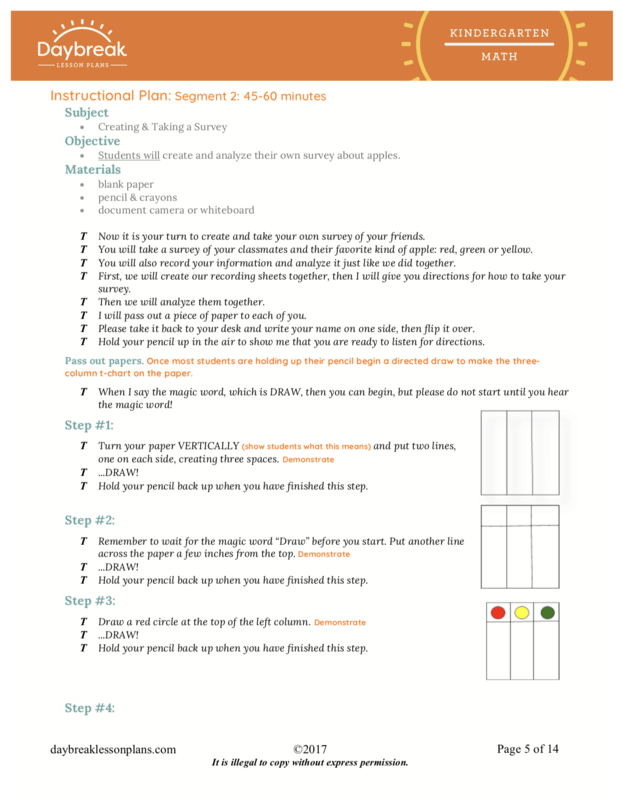 Description: Kindergarten Grade half day of math lesson plans containing 3 separate segments (30-60 minutes each) addressing Measurement and Data and Counting and Cardinality (K.CC.3) (K.MD.3) These lessons include a Guided Art Activity & Counting Petals, Counting Letters and Math Practice with patterns. 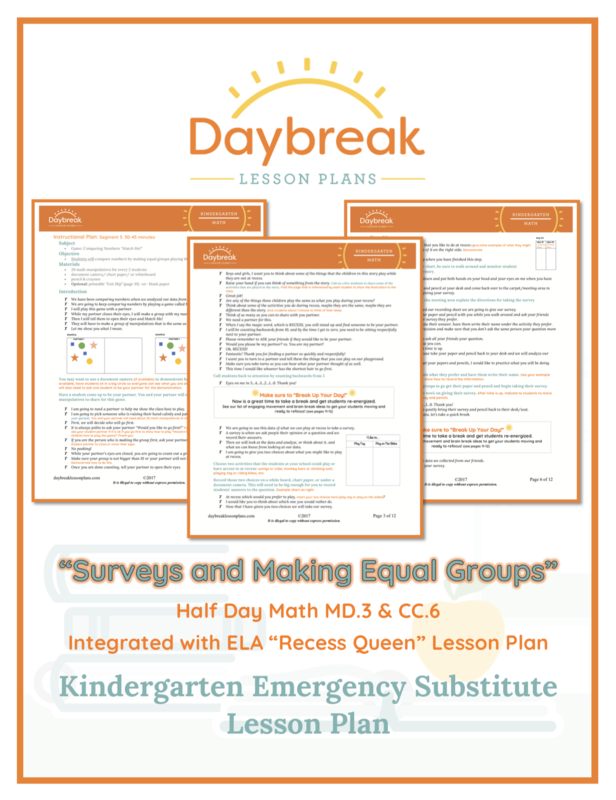 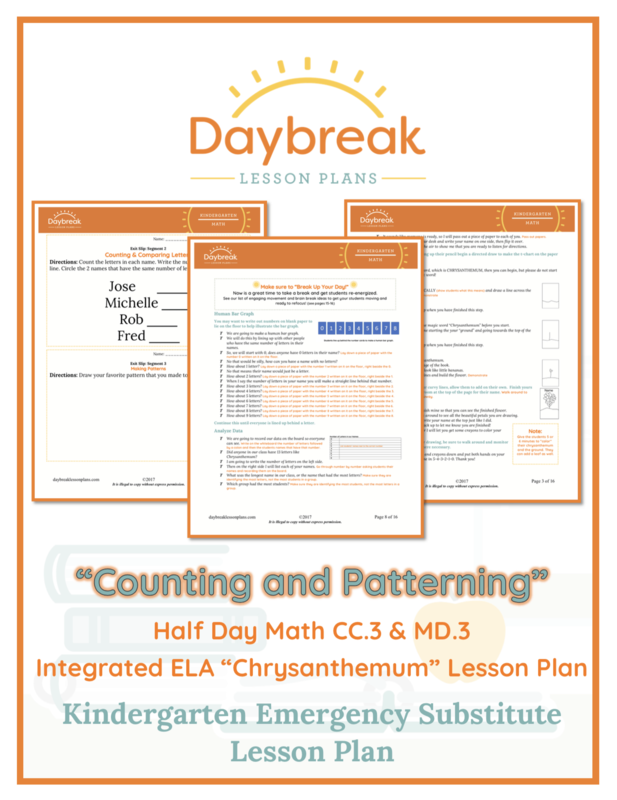 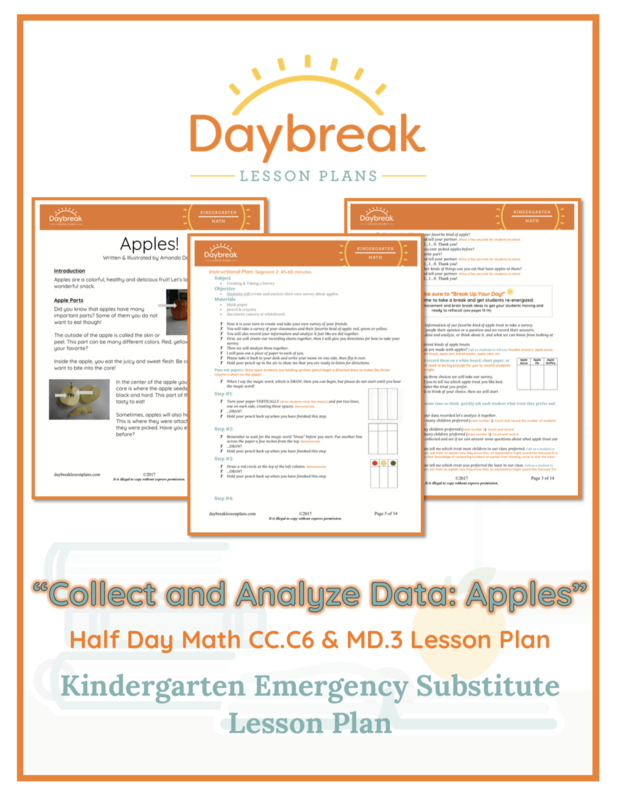 Description: Kindergarten half day of math lesson plans containing 3 separate segments (20-60 minutes each) addressing Measurement & Data: collect/analyze data & Counting & Cardinality: comparing equal groups. 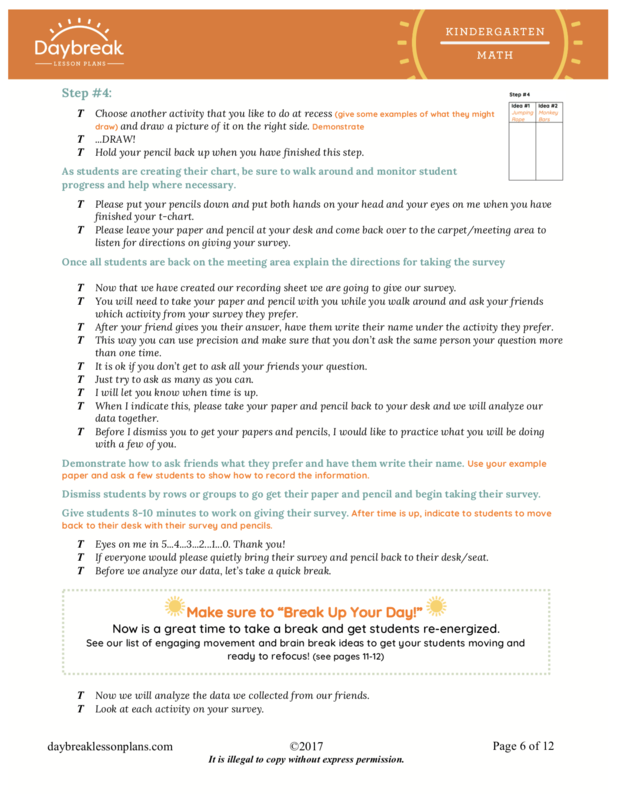 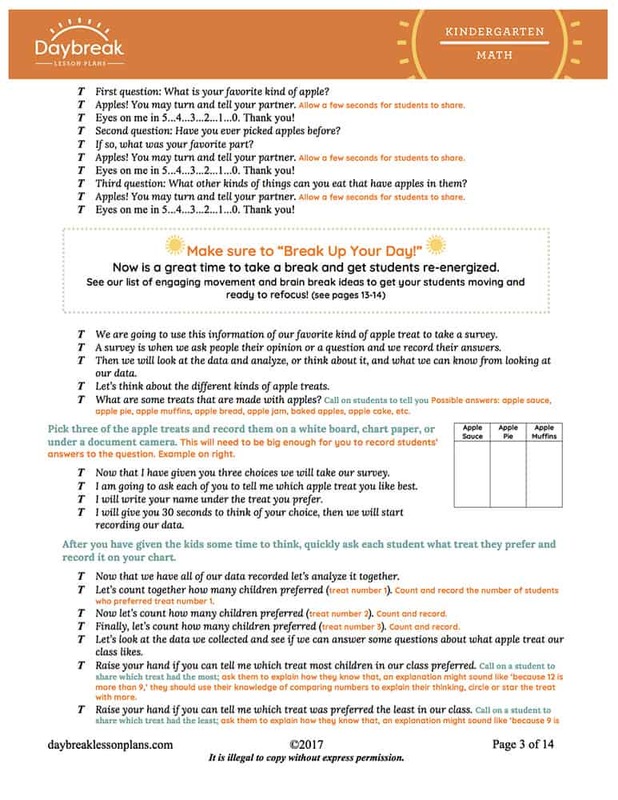 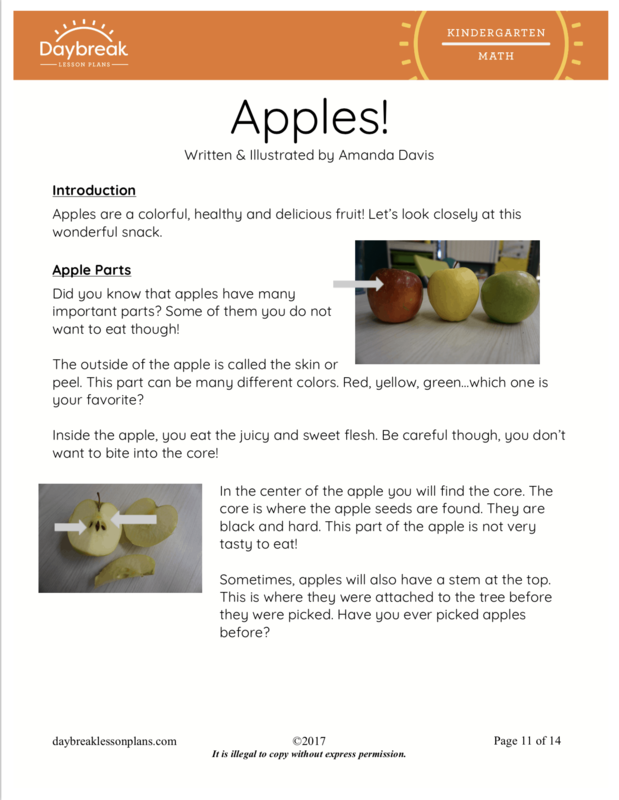 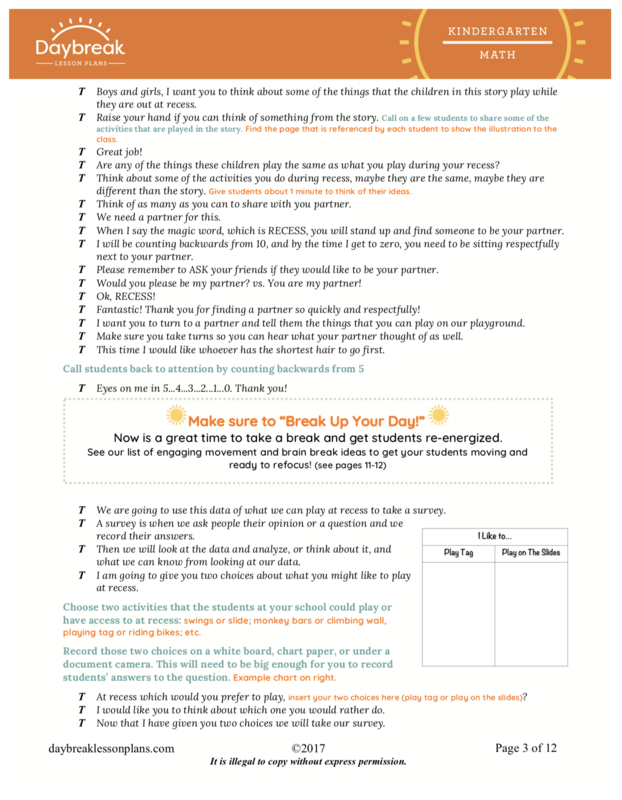 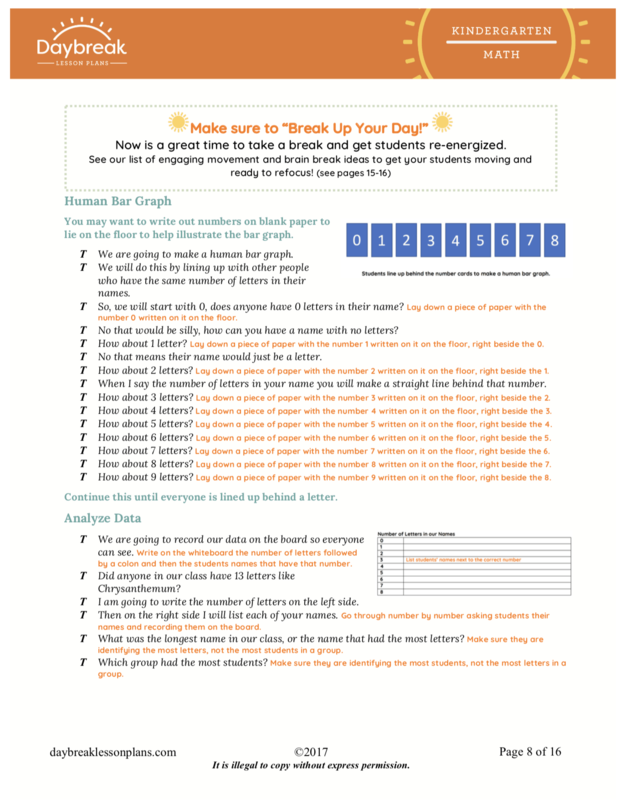 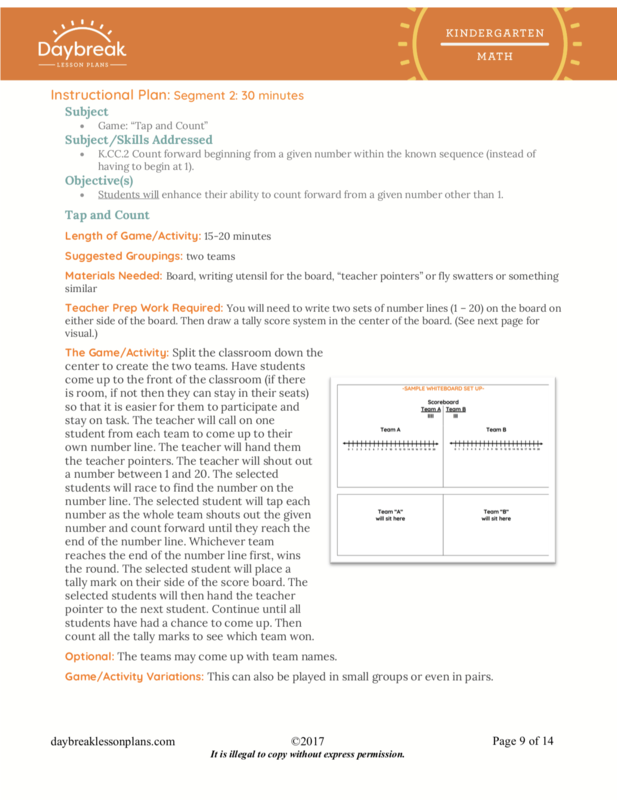 These lessons include a read aloud of Apples, by Amanda Davis, a whole group data collection & analysis, independent data collection & analysis, and game, "Match Me!" 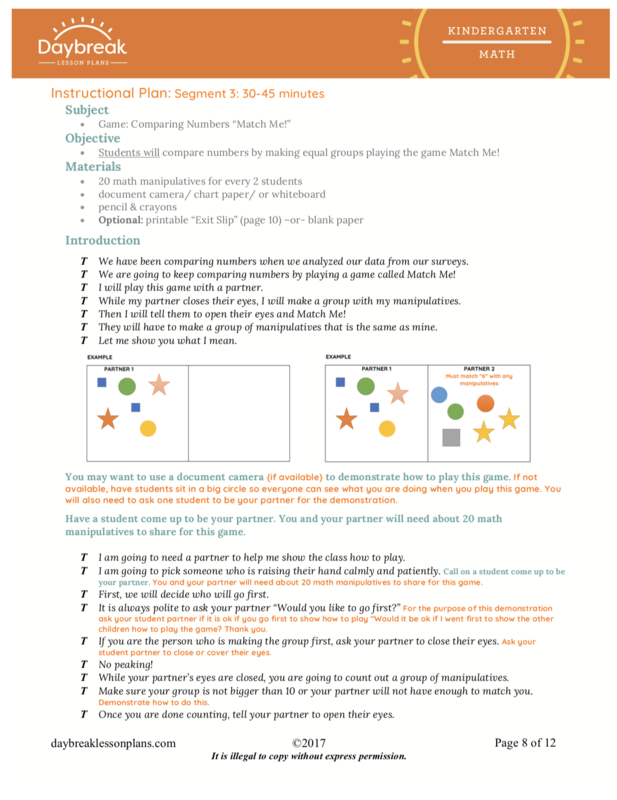 to practice comparing numbers and making equal groups .